The only atlas with all the named streets in Shropshire. BRIDGNORTH, LUDLOW, OSWESTRY, SHREWSBURY, TELFORD, WREXHAM, ALBRIGHTON, BEWDLEY, BISHOP'S CASTLE, CHURCH STRETTON, CRAVEN ARMS, ELLESMERE, KNIGHTON, MADELEY, MARKET DRAYTON, MUCH WENLOCK, NEWPORT, SHAWBURY, SHIFNAL, TENBURY WELLS, WELLINGTON, WELSHPOOL, WEM, WHITCHURCH. 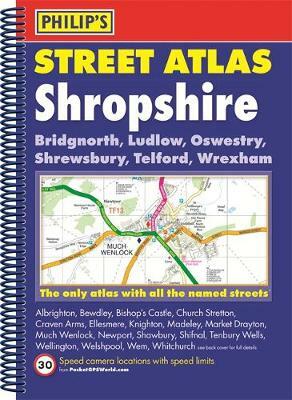 Philip's Street Atlas Shropshire gives detailed coverage of the county in a convenient spiral-bound format. The route planner shows all the A and B roads, and can be used when driving to get close to the destination before turning to the relevant large-scale street map. Other information on the maps includes postcode boundaries, car parks, railway and bus stations, post offices, schools, colleges, hospitals, police and fire stations, places of worship, leisure centres, footpaths and bridleways, camping and caravan sites, golf courses, and many other places of interest. Also included are fixed single and multiple speed-camera locations, with corresponding speed limits.